Champagne may be the most misunderstood category of wine in the world. The major reason for all the confusion is the use of the term “Champagne” appearing on labels of sparkling wines that come from places other than the province of Champagne in northeastern France. But true champagne can only be born in an environment that combines the essential elements of chalky soil, a cool climate, and the Chardonnay, Pinot Noir, and Pinot Meunier grape varieties. These are the crucial elements informing the unique flavor profile found only in wines from that corner of the world. Without them, any wine—even a very good one—calling itself champagne, is just an imposter. Like most good things in life, the better you understand champagne, the more you enjoy it. This friendly guide will help you make your enjoyment of the most glamorous beverage on the planet complete. Ed McCarthy is a Certified Wine Educator, a regular contributor to Wine Enthusiast and The Wine Journal, and the coauthor of four previous For Dummies?? wine books. PART I: What Is Champagne? Chapter 1: Champagne, the Region. Chapter 2: Dom Perignon -- the Legend. PART II: The Magic of the Bubbles. Chapter 3: The Champagne Method. Chapter 4: The Grapes of Champagne. PART III: Styles of Champagne. Chapter 5: Vintage and non-Vintage (Classic) Champagne. Chapter 6: Variations on a Theme: Blanc de Blancs, Blanc de Noirs, and Rose. Chapter 7: How Sweet It Isn't. PART IV: The Great Champagne Houses. Chapter 8: The Top 25 Champagne Houses (A to L). Chapter 9: The Top 25 Champagne Houses (M to Z). Chapter 10: Grower and Co-operative Champagnes. Chapter 11: The Champagne Trade Today. PART V: Buying, Storing, and Serving Champagne. 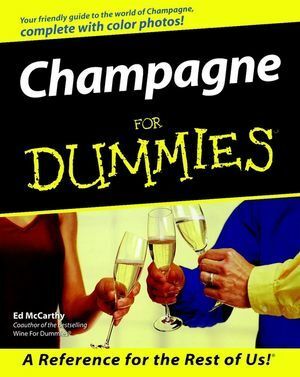 Chapter 12: Practical Tips on Champagne. Chapter 14: Champagne with Food. PART VI: Other Sparkling Wines. Chapter 16: California and Other American Sparkling Wines. Chapter 17: Sparkling Wines from the Rest of the World. Chapter 18: Answers to Ten Common Questions about Champagne. Chapter 19: Ten Champagne Myths Exposed. Appendix A: Glossary of Champagne Descriptors. Appendix B: Directory of Champagne Houses. Appendix C: Champagne Vintages: 1978-1997.